G84 tapping cycle performs tapping operation, tapping is performed by rotating the spindle clockwise, when bottom of the hole has been reached, the spindle is rotated in the reverse direction for retraction. This whole operation creates threads. X Hole position in x-axis. Y Hole position in y-axis. Z Depth, tapping from R-plane to Z-depth. R Position of the R plane. K Number of cycle repetitions (if required) . Once given in program G84 tapping cycle is repeated at every axis movement until G80 is given in program to end tapping cycle. Feedrate override is ignored during tapping. Feed-hold does not stop the machine until the return operation is completed. 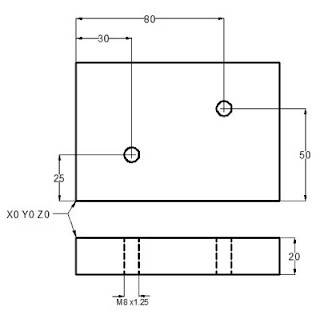 0- CW Spindle rotation command (M03) must be given in part-program. 1- Rapid traverse to X, Y position (pre-drill hole position). 2- Rapid traverse to R-plane. 3- Tapping operation is done till Z-depth (with tapping feed given with G84). 5- Tap is Retracted with the specified feed. 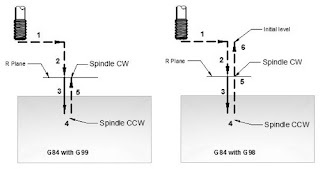 At R-plane spindle is rotated CW. 6- if G98 is given in program then tap is moved to Initial-level. After completing tapping the return height can be controlled by using G98 or G99. G99 Tap will return to R-plane. G98, G99 can be used multiple times during G84 tapping cycle. G84 tapping cycle can be repeated multiple times if K value is given. For working example see G81 drilling cycle.